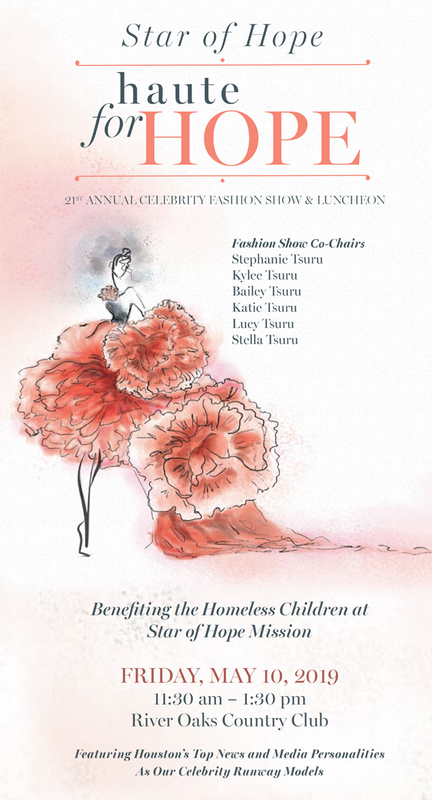 Promoted as Event Sponsor in Fashion Show invitation and program; “Prime Seating” two tables for ten — front row on the runway; prime listing in event invitation, printed program and website recognition—includes logo for corporate sponsors if requested; personalized brick paver displayed in the Star of Hope Walk of Hope; and big screen recognition at event. “Prime Seating” table for ten — on the runway; prime listing in event invitation, printed program and website recognition; and big screen recognition at event. “Premium Seating” table for ten — along the runway; premium listing in event invitation, printed program and website recognition; and big screen recognition at event. “Preferred Seating” table for ten; preferred listing in event invitation, printed program and website recognition; and big screen recognition at event. Table for ten, listing in event invitation, printed program and big screen recognition at event. “Premium Seating”— along the runway; listing in event invitation, printed program; and big screen recognition at event.